Think salads are boring? 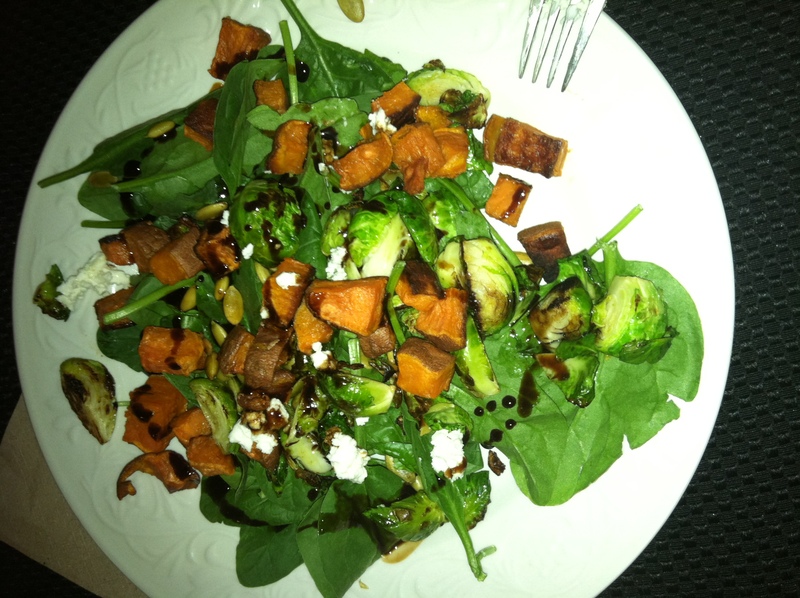 Think again with this nutrient packed, fall inspired salad! Partially cook sweet potato in the microwave to save time, about 4 minutes, or until slightly soft. Peel and cube sweet potato. Toss in a bit of olive oil and roast at 400°F until cooked, about 20 minutes. Meanwhile, quarter the Brussels sprouts and sauté in olive oil until brown and crispy, about 5 minutes. Divide the spinach amongst 2 plates and top with equal amounts of goat cheese and pumpkin seeds. Divide cooked sweet potato and Brussels sprouts evenly between plates as well. Drizzle balsamic on top. Modify the salad as needed for your nutrient needs. If you need more protein, pick up a rotisserie chicken and add it to the mix. If you need more carbohydrate add either croutons or French bread on the side.